If you’re in the Downtown West-end, it’s a good time to visit the Accolade cherry trees in Chilco Park. There are a few chairs in the park, so sit, take a deep breath, and check out the flowers. Some blossoms have started to fall, but there are plenty of blossoms and buds in the trees. Visit this location within seven-ten days to see the flowers at their best. 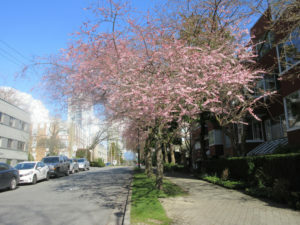 Visit the VCBF neighborhoud maps to find other Accolade cherry trees in your area.